The SoM-A5D35 is a System on Module (SoM) based on the Atmel ARM Cortex A5 ATSAMA5D35 processor. Designed and manufactured in the USA, this wide temperature, fanless ARM 536 MHz SoM has a 10/100 BaseT Ethernet included along with 4 serial ports with handshake. It utilizes up to 4GB of eMMC Flash, up to 16MB of serial data flash, and up to 512MB of LP DDR2 RAM. A SoM is a small embedded module that contains the core of a microprocessor system. SOM-5890 is a COM-Express basic module with Type 6 pin-out that fully complies with the PCI Industrial Computer Manufacturers PICMG COM Express standard. The new CPU module integrates Intel 2nd Generation Core i7, i5, i3, and Celeron processors (code name Sandy Bridge) which support Intel 6th generation graphics core with AVC/VC1/MPEG2 HW decode. It also integrates QM67 (codename Cougar Point) chipset which provides state-of-the-art interface such as PCI Express Gen 2 and SATA Gen3. Power management: Supports enhanced Intel SpeedStep technology, S0, S3, S4, S5, C0, C1, C1E, C3, C6, C7, and ACPI/APM. – Four independent display supported with hybrid multi-monitor capability (integrated and discrete graphics working simultaneously). Chipset: Intel 82579LM Gigabit Ethernet. Base on IEEE 10BASE-T, 100BASETX and 1000BASE-T standard. 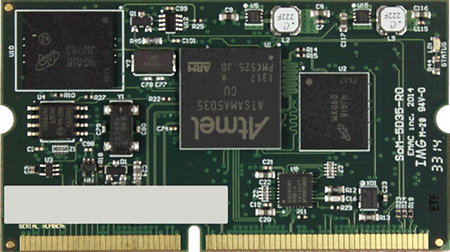 SOM-5890 is a COM-Express basic module with Type 6 pin-out that fully complies with the PCI Industrial Computer Manufacturers PICMG COM Express standard. The new CPU module integrates Intel 2nd Generation Core i7, i5, i3, and Celeron processors (code name Sandy Bridge) which support Intel 6th generation graphics core with AVC/VC1/MPEG2 HW decode. It also integrates QM67 (codename Cougar Point) chipset which provides state-of-the-art interface such as PCI Express Gen 2 and SATA Gen3. 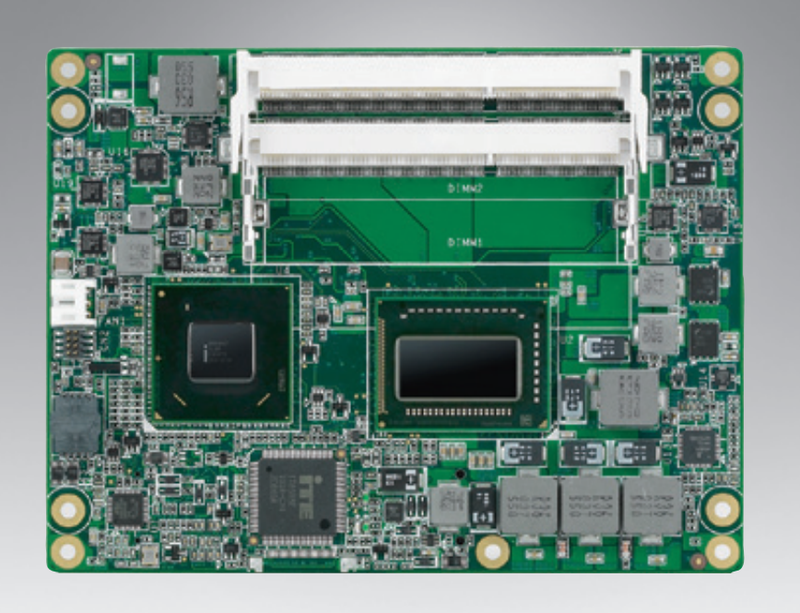 In a basic form factor of 125mm x 95mm, the SOM-5890 provides a scalable high performance and easy to integrate solution for customers’ applications by utilizing a plug-in CPU module on an application-specific customer solution board. 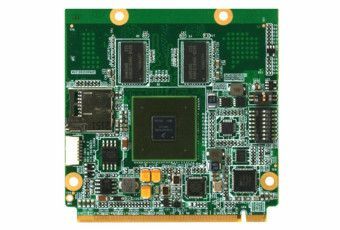 The SOM-5890 with advanced I/O capacity incorporates serial differential signaling technologies such as PCI Express, Serial ATA, USB 2.0, LVDS and HDMI/DVI/Displayport interfaces. SOM-5890 offers design partners more choices for their own applications needing higher computing speeds while maintaining a basic form factor. SOM-5890 complies with the "Green Function" standard and supports Doze, Standby and Suspend modes. 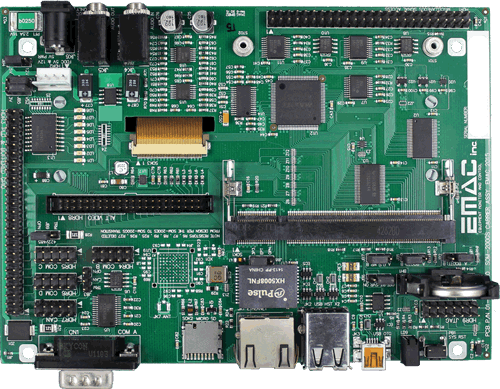 The small size (125 mm x 95 mm) and use of two high capacity connectors based on the proven COM-Basic form factor, allows the COMbasic modules to be easily and securely mounted onto a customized solution board or our standard SOM-DB5700 development board. The SOM-5890 is a highly integrated multimedia COM module that combines audio, video, and network functions. It provides excellent processing capability via Intel 2nd Gen Core i processor, dual channel LVDS, HDMI, DVI,and Displayport for multi-display, DDR3 non-ECC or ECC memory (A or B version respectively) up to 16 GB, and high definition audio interfaces.